"I finally came upon the sage floating cross-legged in the air with no visible means of support, for he had no need of a job." When seated in the Lotus Position, a character may levitate to demonstrate that he or she is meditating particularly profoundly. The Levitating Lotus Position is also used to show that a character is displaying his or her Psychic Powers/Enlightenment Superpowers, intensely concentrating, healing, or is just especially calm. Levitating while in the Lotus Position may also be a sign that a character is powerful or that he or she is far from normal. They may chant "Ohm..." note Real Life Hindus and Buddhists do this. . If someone wakes them from their serene inner calm, they'll often spontaneously lose their floaty power, and collapse in an undignified mess on the floor. See also Meditation Powerup. Compare Chunky Updraft and Love Floats for other uses of levitation. Used in an advert in which a guru can't levitate until he tries the low-fat yoghurt (as the normal stuff makes him too heavy). Of course instead of saying "Ommmm" he says "Yummmmmm..."
During one of Safe Auto's "Terrible Quotes" commercials, three women in a park float in the air as they meditate. The woman in the middle says a strange quote, depending on the version of the ad you watch. At the end of the main ad, the woman in the middle is seen telekinetically controlling a phone, seeing that Safe Auto can give her a great quote. Berserk: The Kushan sorcerer Daiba practices yoga as a way of focusing his magical powers, and likes to float high in the air sitting lotus-style while he lets his magical conjurations do the fighting. Virgo Shaka awaits for the intruders to the House of Virgo like this. No surprise here for someone who seems to be the reincarnation of a Buddha. Bonus points for keeping the pose while wearing the Gold Cloth armor of the Gold Saints. Krishna Chrysaor of Poseidon's Marine Shoguns does the same thing when Shiryu destroys his spear, and he's forced to use his chakra instead. Shiryu uses Excalibur on him and his vital points anyway, and Krishna dies as a result. In 3×3 Eyes, this is the default position for Kelarla (a Cute Monster Girl) whenever she appears, floating above the ground. Fist of the North Star: Ken's rage Toki's "face breaking fist of compassion" attack has him sitting in this position, floating, while using his arms to direct the waves that break his opponents face. Compassionately. The dramatic after-picture has him the same way, but arms in his lap. In Dragon Ball Super, Jiren spends a large part of the tournament he's involved in doing this, because he doesn't consider any of the other participants worth his time. In episode 2 of Joshiraku, while Kigurumi is having an imaginary date, Kukuru randomly floats in the air in this position, amazing the other girls. Gankyou points out that Kukuru is "floating, undisturbed, on a imaginary sea." Dr. Manhattan in Watchmen does the levitating version of the Lotus Position while creating his fortress on Mars. Leonard of Léonard le Génie encounters an entire squadron (yes, flying in squadron formation) of Tibetan monks flying like this. One even shouts mayday because he has a leg cramp, meaning he can't get the landing gear out. Liz talks to a monk from The Shangri-La while he's in the lotus position three feet off the ground. Later on, in the Plague of Frogs arc, she herself ends up doing this. While psychically turning frog monsters' tongues into dragons with her pyrokinesis. It Makes Sense in Context. Robert Crumb's Mr. Natural actually shows some mystical powers by levitating in the lotus position and traveling to the city that way — of course he's tracking down disciple Flakey Foont, who owes him money. Tintin: Tintin in Tibet. The monk Blessed Lightning levitates involuntarily as he's uttering a prophetic warning (and doesn't remember anything afterwards, including levitating) but does so while standing upright. Then he drops down on another monk's foot. Black Moon Chronicles: The priests of the Black Moon faith are often found floating in a lotus position when they're either meditating or accompanying their leader Haazheel Thorn's forces. Scarlet Witch has done this on several different occasions, such as when she is trying to learn more about her powers. Satana uses the lotus pose to float above a pentagram. Jean Grey, being both telepathic and telekinetic, can do the lotus and float. Her adult self, that is. Her teenage self tries it... then gets pins-and-needles after about thirty seconds, to the mild despair of Psylocke, her teacher. Her son, Nathan Summers a.k.a. Cable, prefers to do it upside-down. While casually holding off a grand-scale multinational assault with his telekinesis. The member of one of the families of the map that Merlyn kills in Robin #168 was floating sitting lotus style and meditating when the evil archer approached him. When Raven took Supergirl to Azareth, the priests had Supergirl meditating as she floated in the air. One of the priests says she must not be awoken during her meditation, or she "will never know peace for the rest of her life." Shinji in Thousand Shinji often uses this position when he meditates if no-one is looking. Gali has a similar pose to this while meditating in the first BIONICLE movie, managing to levitate despite not having psychic powers of any sort, except for telepathy between herself and Takua. Master Oogway of Kung Fu Panda has an interesting version of advanced meditation: he uses the crook at the top of his walking stick as a place to rest his head, while he balances the rest of his body on top of it. The Hermit Guru in the Animated Adaptation of Soul Music is in a levitating lotus (with, strangely, a cushion levitating underneath him). He later appears in the Flower Power pastiche, floating over the crowd. In the book it just says he's sitting under a tree (quite possibly a Bodhi tree) with his legs crossed. In the Rainbow Magic movie, Heather does this. At one point she does it upside down. The Golden Child. The title character's astrally projected image does this when it appears to Chandler Jarrell. The first time we see Tom "The Astronaut" of the far future in The Fountain, he is performing the full lotus floating in the air above his small planetoid spaceship (artificial gravity fields may be assisting him). During the climax, when Tom comes to his personal realization of the ultimate truth of life and death, he climbs out of his bubble-like spaceship (while still enveloped in a smaller, person-sized bubble) and assumes the lotus position again in order to meet Xibalba head on. In the midst of his catharsis, he suddenly appears to the ancient Mayan priest guarding the Tree of Life, who is awed by his presence. Subverted in God of Cookery when it is revealed that the character has actually left the ground thanks to the security guards who are in the process of carrying him out. In The Scribbler, Hogan (Garrett Dillahunt) — the only guy in an otherwise all-female halfway house for psych patients — tries out his friend's heavily-modified electroshock therapy device. He not only does a blissed-out Levitating Lotus, but also exhibits a Power Glows aura. The hero of Birdman is doing a lotus position in midair for his meditation practice in the opening scene. The Last Jedi. Luke Skywalker is shown floating above the rock he's meditating on when doing Astral Projection. He then collapses onto the rock in exhaustion, then fades into nothingness with his robe blowing away in the wind. Avengers: Infinity War: On Titan, Doctor Strange is seen floating in the lotus position while he's using the Eye of Agamotto to peer into the different possible futures. In the Callahan's Crosstime Saloon story "The Wonderful Conspiracy", Jake glances behind the bar and sees that Callahan is actually hovering above the floor, seated in the lotus position. It is one of the first indications that there is a lot more to Mike Callahan than meets the eye. In the Dragaera novels, Daymar the Hawklord tends to do this whenever he appears via teleportation, or is simply staying still for a while. Lampshaded in Iorich, in which Vlad wonders why Daymar bothers with a feat that's not especially impressive in a society of sorcerers. 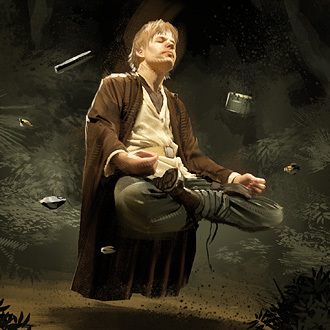 In the Star Wars Expanded Universe, Jedi can't exactly fly on their own — excepting a character in Dark Forces Saga — but they have this trope, which they call Rising Meditation. In Shadows of the Empire: Evolution, it appears Luke Skywalker has figured it out. Han pranks him by shouting "Hey! How'd that rancor get in here?" and makes him topple. In the official pseudo-documentary book The Jedi Path, Luke comments on this but doesn't elaborate. Swellhead has Diogenes Club hero of The '70s, psychic detective Richard Jeperson, come out of retirement in the modern era to take on a reality-warping supervillain. In their final confrontation Jeperson gets into this position for a battle of willpower, but not without some assistance from his pretty female sidekick as he's not as flexible as he used to be. The position comes in handy though when the supervillain tries opening a Trap Door to his pit of alligators beneath our hero, who just floats in mid-air. However the trope is subverted because it's the villain's belief in a Worthy Opponent that's enabling Jeperson to tap into his power; not the chanting or Lotus Position. Commander Sanjurou Sugata from Hikari Sentai Maskman floats in the Lotus Position. Kwai Chang Caine does this sometimes while meditating in Kung Fu: The Legend Continues. Phoebe and Paige sometimes did this on Charmed. Sabrina the Teenage Witch: At the start of the "Sabrina Through the Looking Glass" episode, Zelda leads the Spellman family in some Yoga exercises. When they assume the lotus position and start meditating, Sabrina floats up and bonks her head on the ceiling. Demonstrated by a yogi and Nick Hexum in the video for 311's "Down" . There's a video on the official web site of The Muppets showing what the character Animal does on his days off. One of the things he does is meditate in the levitating lotus position. The video also includes the "Ohm..." element: Animal's meditation chant is "Wooooomaaaaan..."
Dhalsim of Street Fighter performs a levitation in the Lotus Position as one of his Victory Poses, as a Personal Action, and during his Yoga Teleport. This even sparks his rival battle in Street Fighter IV after he's just floating through the streets of Hong Kong like it's no big deal and Rufus comes to the conclusion that he's obviously an alien. Ly from Rayman 2 does the floating variation of the Lotus Position. The Sims: Meditating long enough also allows a Sim to levitate. The Sims 4: In the Sims 4 Vampires gamepack, vampires can use dark meditation which levitates them. The lotus pose and lotus-with-levitation are stock poses in City of Heroes. The Elder Scrolls III: Morrowind: The Physical God Vivec spends his time meditating in this position at the heart of his palace in Vivec City, in part because he's devoting his attention to containing the Big Bad's minions within a barrier and in part because he's slowly losing his divinity due to having lost access to its source, the Heart of Lorkhan. The Wizard class has this as an Idle Animation in Gauntlet: Dark Legacy. Two of Gene's god roulette moves in God Hand has him regain health in a floating lotus position, Zen Revival and Enlightenment, which heal 30% and 100%, respectively. In "The Champions' Ballad" DLC expansion for The Legend of Zelda: Breath of the Wild, Monk Maz Koshia does this to move around for the third phase of his boss fight. The Pokémon Meditite is depicted doing this whenever you encounter one in the wild until Pokémon X and Y, and Alakazam assumes the position after mega-evolving. In Rag Doll Kung Fu: Fists of Plastic, you adopt this position when you regain your health by using up some of your chi. Pitfall Harry Jr. in Pitfall The Mayan Adventure does this as his ultimate Idle Animation, also with levitation. Max levitates in this pose in Sam & Max: The Devil's Playhouse Episode 4 after discovering his Magic Feather, which is even more difficult to do with rabbit feet. Otani Yoshitsugu from Sengoku Basara. Granted, he's actually sitting on a palanquin that levitates due to his sorcery. He doesn't do it because he's meditative or zenlike, though; his disease-ridden body is too frail for him to walk or stand. The Nali randomly do that in the original Unreal and Return to Na-Pali. Certain NPCs in Golden Sun can be seen learning how to do this. There's a mini-game in Wii Fit where you sit very still on the Balance Board. If you sit still enough long enough, your on-screen character starts levitating. This is done epically in the DLC finale of Asura's Wrath by Chakravartin, sitting on top of a nebula, surrounded by galaxies, and casually throwing planets and stars at Asura as he approaches. Nyx's ultimate ability, Absorb, puts her in that position floating inside an energy sphere while absorbing enemy attacks until she reflects back all damage absorbed. There's also an emote that lets players assume this position with any Warframe. The introduction of the Monk class to World of Warcraft has also introduced a number of characters that do this. Player Monks even have an optional ability available to them that enables them to use this as a method of flight. Zenyatta of Overwatch is always in this position, even when moving. It's not clear whether the levitation is the result of his meditation and spiritual enlightenment or if it's just something he can do anyway because he's a robot. Vaarsuvius of The Order of the Stick floats in this position (or close enough for a stick-figure comic) while in a trance to regain spells. Belkar takes advantage of this once to play a nasty prank on V . V also does it at another time to calm down after a panic attack in order to Face Death with Dignity. Anti-Heroes: Turrick the gnome prophet appears like this in Keriss's drug-induced trip . In Rusty and Co. Level 7, Zar the Psion moves around this way. Zar: To clarify, I mean "follow me." Not "try to levitate." That's my schtick. In El Goonish Shive, Tedd first appears in Grace's dream like this to indicate he is also a god. In a RWBY Chibi skit, Ren levitates in a lotus position after completing his training... and then the camera zooms out to show him being lifted off by a fan. The DC Animated Universe's future Green Lantern of the Batman Beyond time (also in Justice League Unlimited) flies around this way. In China, IL, Steve and Ronald Reagan do this after being in stopped time for the equivalent of 100 years. Raven also does this in Teen Titans Go! In fact, she rarely touches the ground at all. Shirley the Loon from Tiny Toon Adventures does this with levitating as part of her psychic powers. Likewise the Wally Llama on Animaniacs, who tries to escape the Warners by essentially floating away like this. They then catch up to him via the same method. Antauri in Super Robot Monkey Team Hyperforce Go! is shown levitating in this position a couple of times, including for a brief while in the opening credits. On Jimmy Two-Shoes, Jimmy does this with levitation when growing a tomato for his Dagwood Sandwich. In The Mighty B!, "Dang It Feels Good to Be a Gamester", Bessie hits this sort of zone, where she becomes telekinetic but only for the final level of this video game. She does a floating lotus during this period, then gently drops back down to the floor of the Hive and comes out of the state. The animated Spirou and Fantasio has two such characters who make several appearances: One is a Magical Aborigine capable of astral projection, and who must tie himself to a rock to avoid flying too high. The other is an Indian scientist who's always about a meter from the ground, possibly even when sleeping. Sensei of Kim Possible is capable of this, lampshaded by Ron when he uses it to survive a trip over a waterfall. Then parodied when Sensei proceeds to speed around in a display of aerial acrobats that prompts Ron to remark that "Okay, now he's just showing off." In "Jack and the Monks", Samurai Jack meets a monk doing this. The Blue Lanterns in Green Lantern: The Animated Series use this often. Warth even uses it rather than walking. Varrik thinks he can do this when he's first introduced, largely due to no-one being willing to tell him he can't. He responds well to Bolin's blunt honesty. Zaheer manages to pull this off after the death of his lover P'li severs the last of his earthly bonds and allows him to achieve the ancient airbending power of flight. In the Animated Adaptation of Soul Music, the holy man Death visits is portrayed as an Eastern mystic hovering on a cushion. He also appears floating above the crowd when the Band With Rocks In is in their hippie-psychedelia phase. While practicing buckball in My Little Pony: Friendship Is Magic, Snips holds a lotus position while levitating himself on buckets used to catch the actual buckball. In the Ben 10: Alien Force episode "Busy Box", when Gwen tries to calm down the Naljian Destructor, she sits in the air and begins meditation, inviting the Destructor to meditate with her. Bloom of Winx Club meditates while training with Maia, in the episode ''From the Ashes". When finally earning her Enchantix, Bloom floats in the air. In Adventure Time's finale, during the final montage, Huntress Wizard does this very high in the sky. Several practitioners of Transcendental Meditation have claimed to be able to levitate while in the Lotus position, and there are even photographs showing them in midair in this pose. However, when investigated by the likes of James Randi, it has so far turned out that these claimants merely know how to bounce while in Lotus position, and have somebody take a photograph while in mid-bounce. Self-proclaimed ninja Ashida Kim has filmed a video where he does this quite unconvincingly.